Unlike other heating systems, boilers don’t rely on ductwork because they don’t warm up air. Rather, they use radiators or radiant systems to distribute steam or hot water. Only those designed to produce steam actually boil water. The others heat water up to 180F instead and use an electrical pump to send hot water to relatively cold home areas. Heating boilers are units intended for central-space heating only. Some modern boilers can also provide hot water. Generally, heating boilers wait for the call from the thermostat, ready to run when there’s a drop in temperature. They start burning fuel to produce heat. The output (steam or hot water) is then sent through a distribution system to warm up the air around the house. As the steam condenses or water cools down, it returns to the boiler to be reheated. The process will repeat until the desired indoor climate is attained. What Is the Difference Between Gas- and Oil-Fired Boilers? The two most popular fuel types used by heating boilers are gas and oil. The units compatible with them share many design elements. Gas- and oil-fired boilers have a combustion chamber to ignite the fuel safely, increase the temperature of the heat exchanger and produce the intended output. One thing that separates them is the fact that oil boilers require a storage tank. As a result, they are trickier and can be costlier to install. 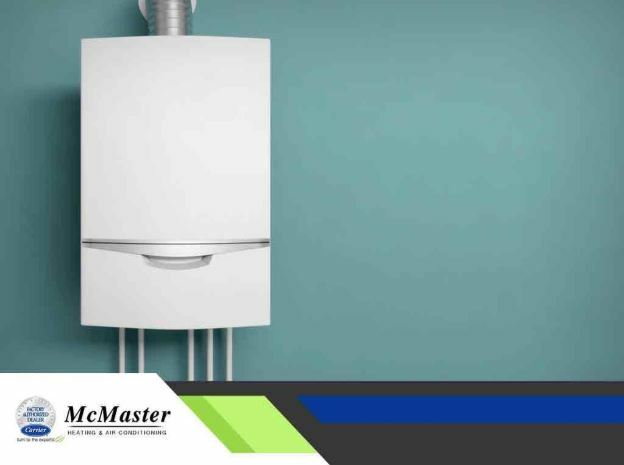 McMaster Heating & Air Conditioning offers an impressive selection of gas- and oil-fired boilers and can integrate your choice to your Carrier HVAC system. Call us at (949) 441-5611 now or complete this form to talk about your space heating needs.